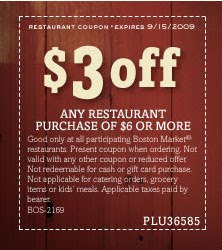 Print a coupon here for $3 off a $6 or more purchase at Boston Market. Good Through Sept 15th. I did notice it excludes KIDS MEALS?